Marriage life had just began for Atimma and Harry. 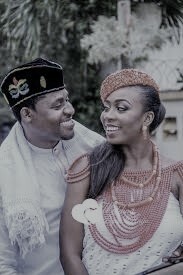 They got married at Saint Peters catholic church in Ikot Ntuen. Linda, her best friend had missed the church wedding. She was supposed to be her maid of honor; But Atimma wasn't angry, she walked down the aisle delightedly in her white, Pearle beaded dress. Atimma felt Harry's eyes on her as she walked down the aisle. She would have enjoyed the walk along with her father, or even her mother, but they had died many years ago; since when she used to be a teenager. At the moment the priest had joined them in matrimony, and the congregation applauded, Harry stared at the ring on his fingers, as if measuring it's bigness compared to Atimma's own. He took her chin and her face to his and kissed her, while the church screamed in excitement. Atimma smiled shyly and hugged Harry tight to herself. After the wedding reception party ended, Harry and Atimma got back home that night with joy in their hearts. Linda, Atimma's best friend visited them for the first time after their wedding. "Your wedding wasn't big like I expected." Linda said shrilly as she took a sip of the coca cola drink she was offered. "Harry and I wanted it low." She replied softly. "Na waooo, and you people still packed into this your small one bedroom flat after wedding, not even a two bedroom in an estate in town." Linda said with her usual straightforwardness. "Well, Harry and I will move out when we have enough cash. We spent a lot at the wedding." Linda laughed out loud, clapping her hands and throwing them into the air. "Atim, how much does Harry even have? He doesn't even have money for common introduction, talk of wedding. You and I know too well that your whole money was used for that wedding, and that Harry's kobo was not there." Atimma frowned and looked away. "Don't let that bother you. It's my money, he is my husband." "Okay o. I just want to let you know that Oga Seno isn't happy that you got married without his consent." she said earnestly. "What consent? He is a married man, I am married now. Is that why he stopped replying my greetings at the office? He should go to hell!" Atimma said angrily. "Is it after you ate his money that you just realized he is married huh?" "But at least Harry was still your bobo." "Stay off Linda! Leave me alone." She yelled and stood to walk away. "I am not condemning you. It's just that I am sad that you left wealth to settle in this ghetto with an okirika seller." Atimma angrily grabbed Linda by the hand forcefully. "Get out of my house!" she yelled as he pushed Linda to the floor. "You're jealous that I am married and you're not!" Linda stood up gently from the floor, she gave a sneering smile as she wiped the back of her denim gown. "You really think I am jealous of this poverty stricken place? Why do you think I refused to be your chief brides maid Atim? I could not bring myself so low in those cheap Taffeta you had wanted me to wear. Who envies this kind of life you're living? I will rather remain single, dating rich sugar daddies, than be married to a man who can't afford my bride price." She paused and then walked stylishly towards Atimma." I mean you married yourself!" Atimma pushed Linda out of the house. Her heart was hammering in her breast like a wild thing, while she felt like it might burst her body any moment. "Never ever you come here anymore!" Linda was frightened, it was the first time she saw her best friend in such mood.